I'm ready for another exciting weekend of football! 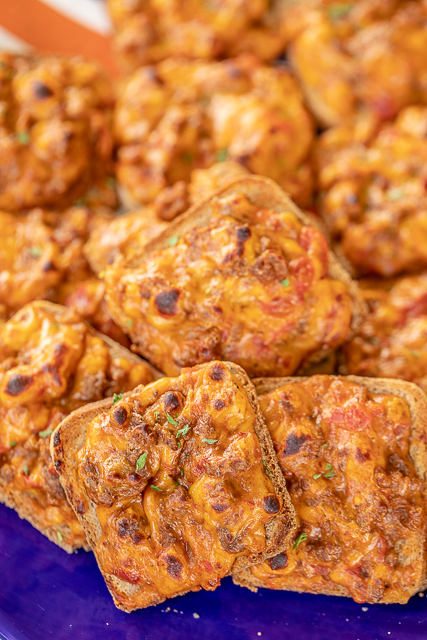 This week we are making these yummy Taco Party Toasts. 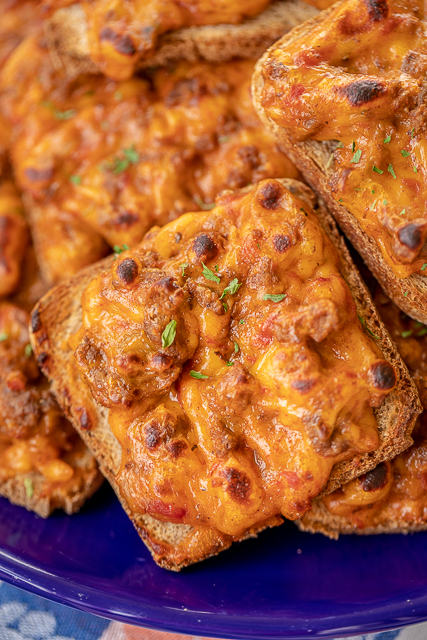 Taco meat, diced tomatoes and green chiles, Velveeta on top of party rye bread. SO good!!! 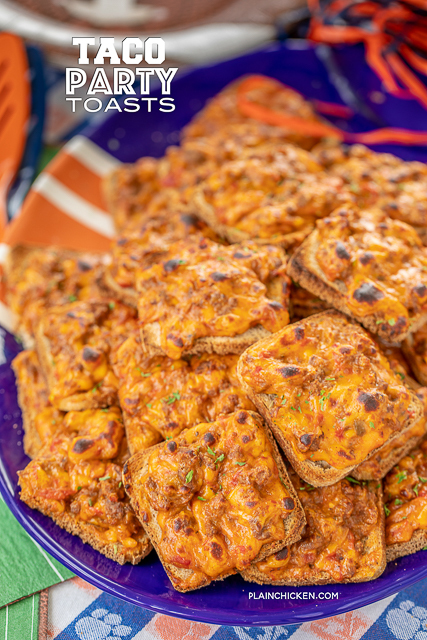 PLUS you can make these Taco Party Toasts ahead of time and freeze until you are ready to serve. BOOM! 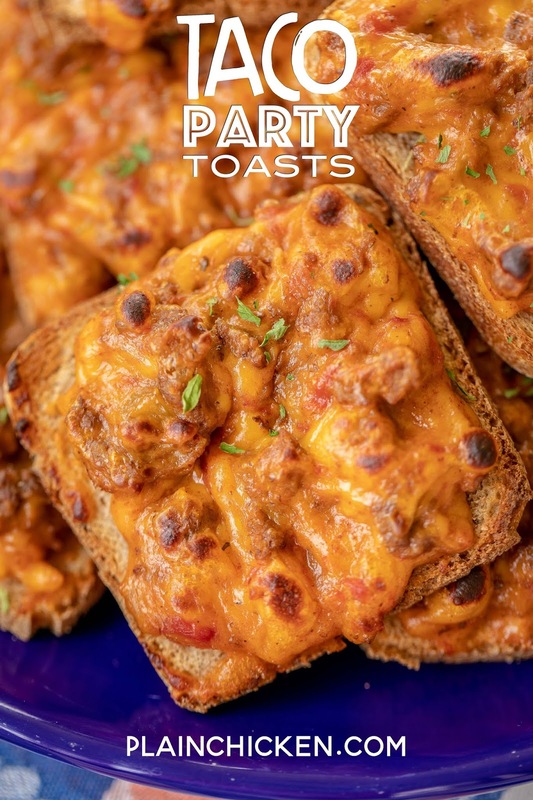 As I said, you can make these Taco Party Toasts ahead of time and freeze for later. I do this all the time and it is such a great time saver. Assemble the toasts and freeze unbaked. When you are ready to cook the toasts, take them out of the freezer and thaw completely before popping under the oven broiler. You can even speed the process along by thawing them in the microwave if you are pressed for time. 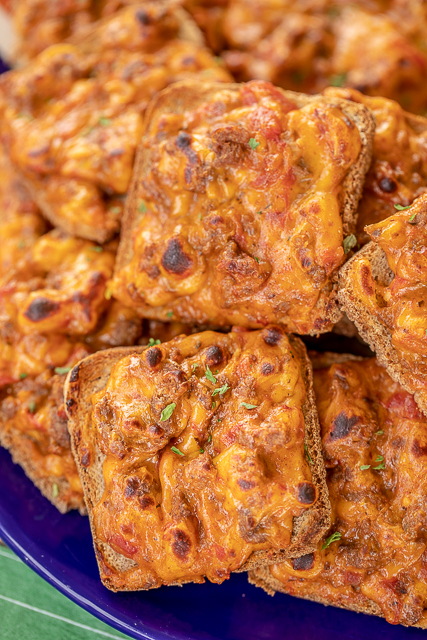 We love these Taco Party Toasts for tailgates, parties or a quick lunch and dinner. With only 5 ingredients, they are a breeze to whip up for any occasion. Give these a try for your next party! I promise you won't have any leftovers!! In a large skillet, cook ground beef until no longer pink. Drain fat. Add taco seasoning and undrained diced tomatoes to skillet. Cook 2 to 3 minutes. Remove from heat. Add velveeta to skillet and stir until cheese is melted and combined with the meat mixture. Spread taco mixture on top of cocktail rye bread slices. Place slices on a baking sheet and cook under the oven broiler until bubbly, 2 to 3 minutes. My husband hates rye bread. What would you suggest as a substitute please? What would you substitute for the rye bread?? ?